[Episcopal News Service] Amanda Morales Guerra might be ripped from her children’s lives and returned to the violent country she fled 14 years ago. 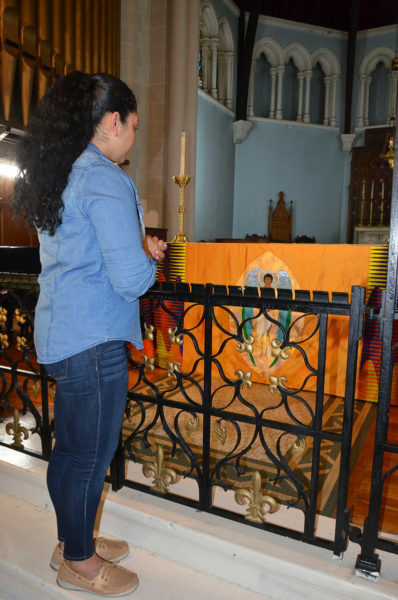 That real fear drove Morales, 33, a Guatemalan native in danger of deportation for entering and living in the United States illegally, to seek sanctuary more than a week ago at Holyrood Episcopal Church-Iglesias Santa Cruz in the Washington Heights neighborhood of northern Manhattan. Her three children were born in the United States and, thus, are American citizens. Since the Morales family arrived at the church, parishioners, neighbors of several faiths and politicians have joined her in solidarity, providing for her family’s physical, emotional and spiritual needs. On Aug. 21, supporters also climbed the steps of the Jacob Javits Federal Building in downtown Manhattan to provide the Immigration Court with two petitions: to request a stay of removal and to reactivate an asylum petition she had previously filed, said the Rev. Luis Barrios, the priest of Holyrood church. In a minor victory for the Morales family, the court agreed to review her appeals and announce a decision after 90 days, Barrios said. Morales fled Guatemala in 2004 because MS-13, an international gang known for kidnapping and trafficking drugs, arms and humans, made violent threats to her and her family. The United States grants asylum to people fleeing from persecution based on race, religion, nationality, social group membership or political opinion in their native countries, according to U.S. Citizenship and Immigration Services. Authorities learned of her undocumented status in 2014 — when she couldn’t produce a driver’s license after a traffic incident — and alerted immigration officials. Since then, Morales, who worked in a factory making strings for cellos, has regularly checked in with an immigration office at appointed times, Barrios said. She pays taxes and has no criminal record, so deportation was a low priority until President Donald Trump’s administration began calling for stricter enforcement. U.S. Immigration and Customs Enforcement performed close to 40 percent more enforcement and removal arrests in the first 100 days of Trump’s term than in the same period last year, according to ICE. That means deportation officers administratively arrested 41,318 individuals on civil immigration charges, compared to the 30,028 people arrested in the same time in 2016. Administrative arrests are made by a government official, in this case an ICE officer, without a warrant that has been reviewed and authorized by a judge. It’s a non-criminal removal warrant. “ICE agents and officers have been given clear direction to focus on threats to public safety and national security, which has resulted in a substantial increase in the arrest of convicted criminal aliens. However, when we encounter others who are in the country unlawfully, we will execute our sworn duty and enforce the law,” said ICE Acting Director Thomas Homan in a first 100 days feature on ICE’s website. Even so, churches, schools and hospitals have long been considered “sensitive areas” that authorities usually don’t enter. Churches in the Diocese of New York are free to make their own choices about what sanctuary means and how they will provide it, said Bishop Andrew ML Dietsche, in a statement a day after Morales went public. 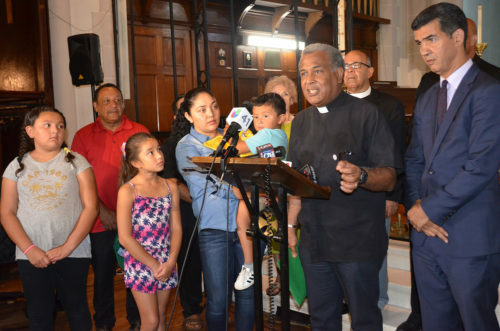 He encouraged parishes to protect their members and to provide legal and pastoral help to undocumented people, all the while understanding the risks for the parish and sanctuary family. “Yet in the changing landscape regarding immigration and deportations in which we find ourselves, I believe this is a well-considered choice marked by integrity and faith. The clergy and people of Holyrood Parish have my full support, the support of this diocese, and this imperiled family has my prayers,” Dietsche said. Dietsche’s colleague, Bishop Mary Glasspool, compiled a list of resources for churches to use when encountering sanctuary issues. After Morales was told to purchase a one-way ticket to Guatemala and show up at her next immigration appointment, she left her job and almost all her belongings at home in Massapequa, a hamlet near Amityville on Long Island. The Rev. Juan Carlos Ruiz, co-founder of the New Sanctuary Coalition of New York City, helped Morales find Holyrood church. Formed in 2007, the coalition is an interfaith network of congregations, organizations and people that helps families and communities resist detention and deportation in order to stay together. Barrios has been a coalition member for six years. While Morales has been enclosed within the church’s Gothic walls, parishioners and people from all over have helped the family, including members of other churches, university students, grade-school teachers, hospital personnel, seminary students, synagogue members and even regular visitors at Holyrood’s soup kitchen. “This woman in her 80s with a walker comes to the soup kitchen we have here, and she came to give Amanda $5. You share what you have. Amanda was crying all over after that,” Barrios said. Members from Fort Washington Collegiate Church in Washington Heights, part of the Reformed Church of America, donated sleeping bags to the Morales family. 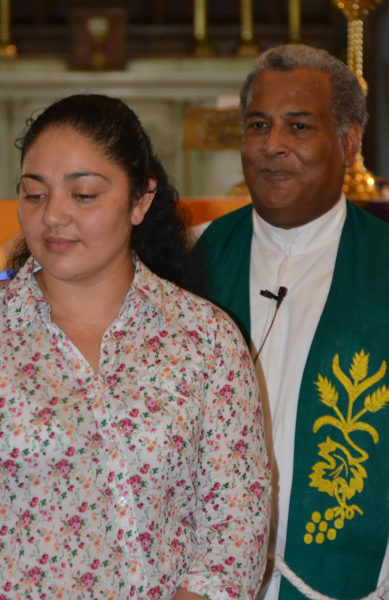 While churches across the United States provide sanctuary to people quietly, Morales decided to go public, not only to pressure the government for her cause, but also to put a face to the plight of many immigrants like her, living in terror that their families will be torn apart, Barrios said. The sanctuary concept is even bigger than immigration issues, Barrios said. “It’s to create to a safe space for groups that are marginalized or oppressed, such as people of color, LGBT groups. We have to respond,” Barrios said. — Amy Sowder is a special correspondent for the Episcopal News Service, as well as a writer and editor based in Brooklyn, New York. The key fact in this matter, in my opinion, is the filing of the appropriate petitions for relief. Ms Guerra and her supporters have taken the cirrect legal steps. I applaud this fact and will pray for her to succeed and remain in the US. Thank you so very much for your help with this family! How many more can your help? There are so many with so much pain and fear.